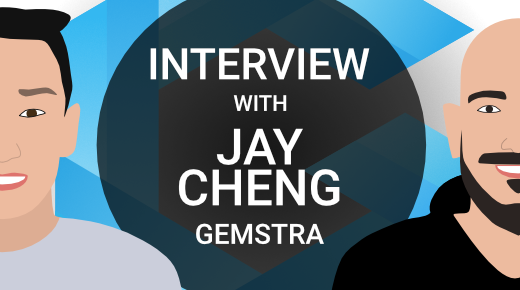 I am joined by Jay Cheng, who is the CEO of Gemstra, a blockchain ecosystem that aims to connect brands and influencers. Hello Jay! First of all, can you explain what Gemstra is all about – what are you guys working on? Hi Christian! Thanks so much for having me. Like you said, Gemstra’s about powering the future of influencer (or KOL) commerce. We’re creating a blockchain infrastructure and a suite of products/platforms in our ecosystem that connects businesses (merchants, brands – any company in the business of selling products) and influencers (key opinion leaders, instagram or youtube influencers) directly to drive commerce. There are 600 million influencers today out of the 2.7 Billion social media users getting paid $10Bn in fees this year for marketing. That number is growing 20% a year and accelerating at that. Influencers and KOLs are shaping consumer demand today more than traditional marketing – and Gemstra is going to be the de facto technology and token to power the influencer economy. Gemstra’s blockchain ecosystem features different applications, for example “Boutiques” or “Knowy”. Can you give an overview of these different applications and describe their purposes? Boutiques was a proof-of-concept we launched in 2017 that quickly became a live and profitable marketplace. With Boutiques, we created a commerce platform that was api-based and invited influencers to launch customizable boutiques featuring products by an early set of brands that wanted to engage influencer selling. An influencer signs up for Boutiques and is given a store which can be customized with products – so they can turn on and off the brands or products they wish the store to sell AND can be personalized with user-generated content – meaning they can replace default media like pictures with user-generated content. 3000 influencers poured in to promote 8 brands and drove us quickly to a 7-figure run rate. So we knew we struck a nerve in the consumer market. Businesses want to connect with influencers to drive sales. That’s a big business. Fortunately, our CTO built a platform that was api-based and decentralized to boot, so storing data on blockchain to democratize custodianship was an easy next-step to protecting the interests of brands and influencers alike. Tokenizing the ecosystem and building a broad-based infrastructure would allow even more businesses to come into the market. Knowy is a module within our ecosystem that serves as a review engine. But it’s a very powerful one that the world has never seen. First of all, every review writer is an influencer – whether they know it or not. And each review carries weight, but should carry different weight based on how well the reviewer knows the subject matter. The more you know, the more Relevant your review should be. In knowing, you gain Reputation in certain categories as you write more reviews and more importantly as other users upvote or downvote your reviews (yes you can lose Reputation). Your Reputation is factored into the Relevance your review has on the final product review. Merchants or site operators can integrate with us to show Knowy reviews and pay per impression in GEMS – our native token. 50% of GEMS collected are distributed to reviewers based on Relevance of their review. Influencer marketing is a growing sector that suffers from inefficiencies due to a mostly intransparent market. What makes you confident that Gemstra can make this market more efficient and how do you plan to motivate brands and influencers to use your platform? Well, we’re going to make it free for Influencers to join. We’ll make it free for Brands to join. We’ll make it free for Merchants to join. (We will open source the Boutiques codebase.) They will have to stake tokens at some point to protect mutual interests. The data decentralization will ensure all participants are protected. Gemstra is a first mover with a live use-case running that has friction we’ve purposely put in place in the form of monthly fiat fees. Let’s talk about the team behind Gemstra. When did the development start? How many people are working on the different parts of the ecosystem and what are their backgrounds? Are you hiring currently? Development started for Boutiques in late 2015 when it was an early idea. We launched in mid 2017 with a centralized data structure but decentralized architecture. In early 2018, we started to look into protocols that would be usable/scalable for our purposes. We started coding solidity / EVM and designing the infrastructure layer if you will. There are 14 employees across the org. We have our CTO and 2 full-time developers. There are 3 other executive roles and 1 marketing person who handle both ecosystem and Boutiques. Everyone else is mainly operating Boutiques. We’re always looking for strong candidates, not immediately placing but will be shortly. Adding to the partnership with Cobinhood for the IEO, you also decided to use DEXON instead of Ethereum as your blockchain infrastructure. What led to this decision? Given that DEXON is a brand-new platform, could you already start building on top of it? How difficult is it to adapt your already existing software from Ethereum to DEXON? The partnership actually went hand-in-hand. My partner Jo first connected with Popo Chen. We both loved his energy and ethos. We came in touch with the broader Cobinhood team and jived with their culture, not to mention their collective pedigree. I’m of Taiwanese descent – born in Taiwan but moved to Los Angeles at age 3. My folks talked up National Taiwan University throughout my upbringing – they called it “Harvard of Taiwan”. So, we were even more impressed that 80%+ of the Cobinhood team were NTU alum. I remember our first call with Cobinhood was about token liquidity and they mentioned Dexon as a by-the-way. We’ve yet to know how data costs scale with IPFS or any decentralized storage solution, but Dexon showed us a path of storing data on chain at a cost that was scalable. The culture, the team, the tech – it was a sensible marriage. The best part is that all of the codebase we had written for payments and checkout using our token were 100% adaptable to Dexon as DVM is based on solidity. 1. How much money are you aiming to raise – what is your soft cap and hard cap? Well we don’t have a soft cap in mind as we’ve got a business in place that’s profitable. The show will go on regardless of the sale. The hard cap is set at 40,000 ETH. This will provide us the funds to do everything outlined in whitepaper and scale very quickly. 2. What will happen to unsold tokens, if you don’t reach your hard cap? Any tokens unsold from the community sale pool will be burned. 3. Were any coins sold in a private sale and if yes, have these been sold at a comparable or a significantly lower price compared to the presale? No. This is the first round of sales. 4. Do you already have an approximate timespan when the IEO will be completed and the GEMS tokens will be tradeable? The IEO Presale will be completed on June 30. We are eyeing a public sale period sometime in July. Token distribution will happen in early August with listing on Cobinhood and LAToken at end of August. 5. Previous IEOs on Cobinhood have airdropped a small percentage of their tokens to COB token holders – are you planning to do that as well? Yes – we have generous airdrops planned, though details not released yet. We also have super fun bounties that I’m encouraging everyone to participate in. Alright! My last question of this interview is about the utility of the token: What can it be used for and why will people use it? The first and easy one – payments. GEMS can be used for payments on Boutiques and with any Merchant engaged in our infrastructure (Astra). We’ll be connecting with all retailers who want anything to do with connecting with influencers large and small to accept GEMS in checkout. Second – rewards. If you’re an Influencer or KOL, if you have a following you’d like to monetize, then you want GEMS. This is going to be the token that the Influencer/KOL economy trusts. As a Brand or Merchant, you need GEMS to reward Influencers for activities. We’ll always have a convert-to-fiat option, but will bonus GEMS according to the cost of friction. This will be especially useful in cross-border cases. What we’re trying to do is give global access to Influencers driving commerce for Businesses. Last – governance. As an Influencer, you’ll need GEMS to stake if you want access to Boutiques or any Merchant. You’ll need GEMS staked to access certain Brands inside Boutiques or any Merchant. The more GEMS you have staked, the more Reputation you will have in the broader ecosystem – including Knowy and other modules. As a Brand or Merchant, you need GEMS to stake as well. Merchants will require a certain amount staked by Brands based on the number of Influencers. The Foundation will require a certain amount staked by Merchants based on the number of Influencers or Brands. Voting and additional equity staking will be incorporated in the future. Awesome, that wraps it up! Thank you very much for this informative interview!